JEA’s board of directors selected Ryan Companies US Inc. to build a new campus at 325 W. Adams St. near the Duval County Courthouse and State Attorney’s Office. JEA’s board of directors selected the Minneapolis-based development company Tuesday to build a new campus at 325 W. Adams St., near the Duval County Courthouse and State Attorney’s Office. The estimated $72.2 million development comprises a nine-story, 207,810-square-foot tower for offices and a customer service center and a detached 850-space parking garage. Ryan Companies’ bid received support over two other proposals – a site near TIAA Bank Field at Lot J, and one on the Downtown Southbank near the Kings Avenue Skyway Station. JEA will relocate from its campus at 21 W. Church St. after construction. Ryan Companies plans to finance the deal with cash and debt backed by Wells Fargo. JEA initially would lease the building for 15 years. 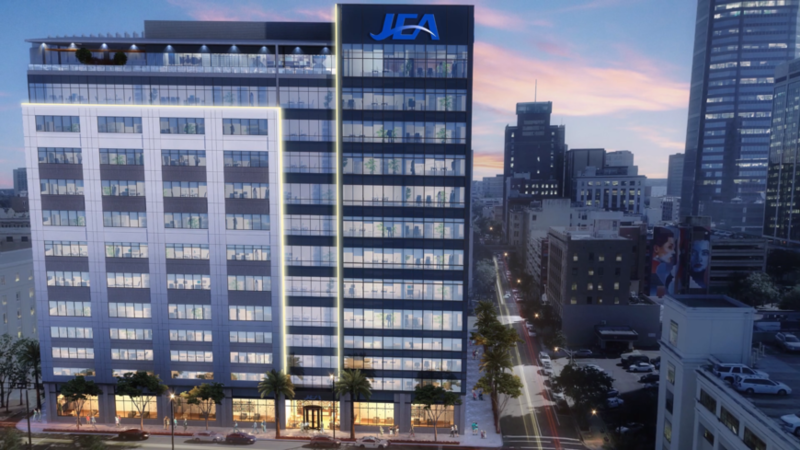 A rendering of the planned JEA headquarters. The estimated $72.2 million development comprises a nine-story, 207,810-square-foot tower. Credit Via Jacksonville Daily Record / Ryan Companies US Inc.
JEA’s footprint covers 195,426 square feet, and rent is calculated based on $32.97 per rentable square foot. That is $6.4 million a year for the first year. The rent escalates 2.5% each year after. CBRE, JEA’s real estate consultant leading the project, estimates JEA’s financial burden over that time including rent and other costs associated with occupancy would top $139 million. Ryan Companies needs to purchase the property from the city, which will take months. It begins with the Downtown Investment Authority issuing a formal request for proposals. The RFP process requires the city to advertise a property sale to the public, allowing interested buyers a chance to make an offer. The DIA board would review those offers and vote to enter a purchase-and-sale agreement. A property sale also requires approval from Jacksonville City Council. The Duval County Property Appraiser lists the market value for the 1.52-acre site at $1.96 million. The Ryan Companies US Inc. plan for a new JEA headquarters is to build on this site at 325 W. Adams St., near the Duval County Courthouse and State Attorney’s Office. Ryan Companies will need to purchase the land from the city. Ryan Companies Regional President Douglas Dieck on Tuesday said his team initially budgeted $3.3 million for the land purchase. Ryan Companies also will spend the next three or four months completing a lease with JEA. Outgoing JEA board Chair Alan Howard said during the meeting that the lease agreement is contingent upon Ryan Companies buying the property. “We can’t lease a property they don’t own,” he said. According to a preliminary schedule, Ryan Companies could begin site work by September. Dieck said he expects construction to take 25-26 months, meaning JEA could occupy the space by November 2021. Through Jacksonville 1-C Parcel One Holdings Co., Jacksonville Jaguars owner Shad Khan’s Iguana Investments Florida LLC planned to partner with The Cordish Cos. to develop a JEA office building at Lot J, a surface-level parking lot west of TIAA Bank Field. JEA would have been the corporate anchor of a mixed-use development comprising a Cordish “Live!” entertainment venue and other uses. “It’s a good sign when local interest is high in growing, developing and investing in Jacksonville and we hope that will continue for a long time,” Woodcock said. Stewart Green with CBRE said during the meeting the Lot J proposal came with more risks compared to the other bids. Green said Lot J had seven risk areas including land control, the need for environmental remediation, land viability, the progress of the draft lease agreement, the time for planning and gaining necessary approvals from state and city agencies, the need to build a parking garage and the state of ongoing negotiations since March. Attorney Paul Harden, on behalf of Iguana Investments, disputed CBRE’s risk assessment, saying the Jaguars understand and actively are addressing the environmental and other concerns. When the National Football League awarded Jacksonville a franchise, the city performed some environmental remediation on the property, which once was an industrial site. Under the parking lots, petroleum and other contaminants are contained by a clay slurry wall, an underground barrier installed to stop groundwater flow. According to a 1996 agreement with the Florida Department of Environmental Protection, the Lot J property is prohibited from being developed as a residential or recreation area unless further remediation is performed. Harden said the Jaguars have reached an agreement with DEP officials on a remediation plan. Additionally, he said the development team has an economic development agreement for all of Lot J ready to send to the city within six days of the JEA decision. That agreement, Harden said, would address concerns over who pays to build a 3,000-space parking garage planned to serve the Lot J mixed-use development. Harden said it would be a public-private partnership between Iguana and the city. JEA’s real estate department noted that a draft agreement with Khan’s entity still had 48 “significant” or “major” contractual issues to work through – compared with 17 issues with the Ryan Companies agreement. Following the meeting, Howard said while he wants to see Lot J succeed, it wasn’t JEA’s job to act as a catalyst for one development over another. “We have to be good stewards of our fiscal assets,” he said. 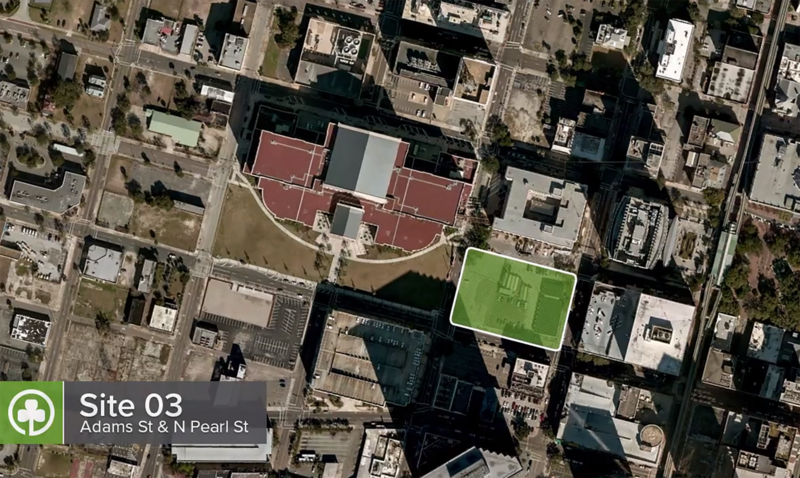 Developer Mike Balanky, through Kings Avenue Station P3 LLC, pitched JEA to relocate to the Downtown Southbank on property he controls on Kings Avenue, next to the Kings Avenue Skyway Station and two hotels he developed. Balanky reminded the board that his site was pad-ready, had a garage and was near a public transportation hub. After the Tuesday meeting, Howard said JEA preferred to be within the DIA boundaries, but the Southbank property was outside. “It was just a little too far away,” Howard said. That, along with 43 outstanding contractual issues in the draft agreement, were reasons in favor of Ryan Companies. Balanky, who has developed several projects in the area, said he’s received interest about what to do next with the site. “Ideally, we may do a residential project there,” he said, citing high construction costs for office towers. “We’ve been buried in this process with JEA, so right now we’re just evaluating what’s possible there, but we do have interest,” he said. Howard said JEA will sell the Church Street headquarters as part of a larger divestment strategy that could result in $100 million of unused or excess JEA real estate being sold. “If we could sell it tomorrow and lease it for three years while the new office is being built, we’d do it,” Howard said. The campus includes the 19-story tower and a six-level customer service center built in 1967. JEA has occupied the space since 1988. JEA CEO Aaron Zahn said previously that redevelopment is costly and not ideal considering the footprint is too large and antiquated for JEA’s long-term needs. On Tuesday Howard noted that two floors were shut down in recent weeks because of water damage and that the building has serious structural deficiencies. Since 2009, the utility has spent more than $11 million on repairs and ongoing maintenance. That point hit home during Tuesday’s meeting when fire alarms went off on the 19th floor.